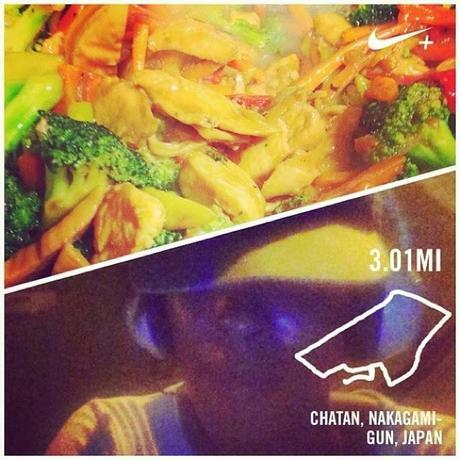 This past sunday, I wanted to do a recovery run of 3 miles after running 6 miles while it hot and humid on Saturday. 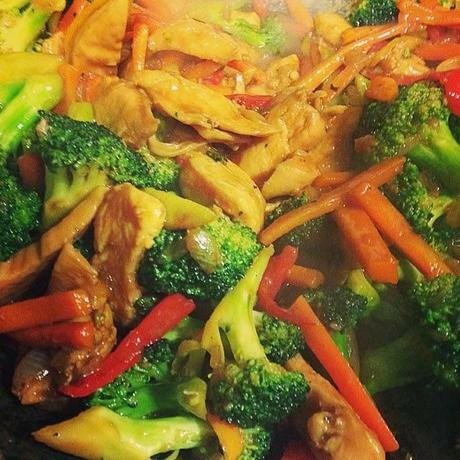 I planned on making a fibrous meal for dinner- Stir fried chicken and lots of veggies! So I prepped and cooked it, but decided to wait until after my run to eat. I didn't want anything to prevent me from running. At least for me, eating a meal full of meat and veggies is a sure way to get cramps! So I went for my run, ran fast as hell and annihilated my meal when I got home. I came home to many compliments from my family about the meal! I love stir-fries! They're quick and easy to make- even homemade! Use whatever veggies you want/have on hand. This recipe is inspired by Ellie Krieger's Teriyaki marinade which is basically the same as stir-fry sauce! Serve with rice or noodles or with nothing else. Combine the first 7 ingredients in a small bowl and stir until evenly combined. Pour half of the marinade over the chicken, and mix until evenly coated. Marinate for 15 minutes or overnight. Heat the 1/2 tablespoon of the oil of your choice along with 1/2 tablespoon of sesame seed oil in a non stick pan or wok over medium heat. First cook broccoli and carrots for about a minute and then add the rest of the vegetables. Stir often. Cook about 5 minutes then remove from pan and set aside. With the empty pan still on medium high heat, add the remaining 1/2 tablespoon of oil and sesame seed oil. Cook chicken until nearly cooked through about five minutes, add the veggies back to the pan and remaining stir fry sauce. Stir until mixed thoroughly. Lower heat and allow to cook about 2 minutes or until chicken is cooked through. If the sauce looks too thick add about 1/4 cup water.